3 Amazon Quiz – How To Win LG Q6 SmartPhone? Amazon Quiz time LG Q6– Hi Guys, welcome back to avjtrickz. 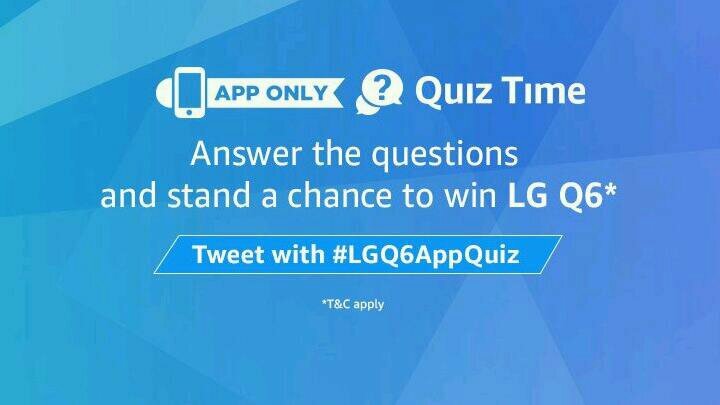 Amazon India Comes Back With Another App Only Quiz, This Time Prize is Big & Quiz is Simple, You Will Get a chance to win Free LG Q6 by paying this quiz. There are a total of 14 (Fourteen) Prize(s) that will be given under this Contest. Winners will announce on November 30 and The Prize will be delivered to the winner on or before 20th December, 2017. Previously Amazon conducted many quizes and we posted some of Amazon Quiz Time Quiz answers & All Amazon App Treasure Hunt items, Now Here is Exclusive Chance To Win Free LG Q6 from Amazon. Also we have added all the answers below. So don’t waste your time, follow below instructions to play and win! Amazon Quiz – How To Win LG Q6 SmartPhone? Just ⬇Download Amazon App In Your Mobile From playstore. Now Just Open The App & Create/Signin Into Amazon Account. Now Just Open the App Banner & You Are About to Start The Quiz With “Start” Button. Which of these is the technology in LG Q6 Display? Every LG Q6 bought on amazon.in comes with a free one-time screen replacement valid for the period of 6 months? What is the aspect relation of the LG Q6 full vision display? which of these was named international word of the year 2013 by theOxfordd dictionary? which of these is the features of the LG Q6 front camera? After that you Will get the Congratulations Banner. This Contest will commence on 15th November from 12:00:01 a.m. (IST) to 11:59:00 p.m. (IST) (“Contest Period”). The draw of lots will be carried out during the Contest Period for the questions and a total of 14 (Fourteen) participants will be selected as winners by a random draw of lots. A total of 14 (Fourteen) participants will be selected as winners of the Contest. The declared winner(s) will be eligible for winning a LG Q6 Mobile Phone each (hereinafter referred to as “Prize(s)”).